MUMBAI, India: The ministers and South Asian business leaders addressing the CII Partnership Summit being held in Mumbai, Sahar India have called for creating common voice by eliminating distrusts between nations and improve ease of doing business for shared prosperity. 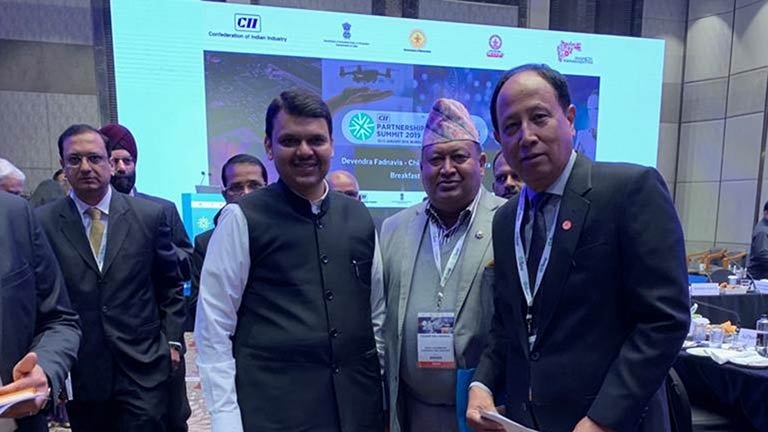 The CII partnership summit being organized in Mumbai is being participated by 44 countries of Asia, Africa and European countries including Nepal. Confederation of Indian Industry (CII), a counterpart of the Federation of Nepalese Chambers of Commerce and Industry (FNCCI), organized the event in which Nepalese private sector delegation was led by Mr Chandi Raj Dhakal, former president of FNCCI/distinguished member accompanied by Mr Kishor Kumar Pradhan, Vice President of FNCCI and Mr Gopal Prasad Tiwari, Officiating Director General of FNCCI. Nepal government delegation was led by Minister for Industry, Commerce and Industry (MOICS) Mr Matrika Prasad Yadav. Addressing the programme on "Enhancing Economic Cooperation in South Asia" Mr Chandi Raj Dhakal, former President of FNCCI and vice president of SAARC CCI said that as South Asia's role is critical in driving the global economy, the emerging sectors of Nepal to be connected and investment in joint partnership with SAARC countries would be in the areas such as tourism, hydropower, manufacturing, agriculture and other sectors in an innovative way. South Asia is least integrated in terms of intra-regional trade, which is less than 5 per cent, need to be increased through partnership in a greater extent. This investment partnership in diversified fields, helps in making the society inclusive, equitable growth and modernized. Mr Dhakal said that Nepal is in a transition and adopting federal system like in India, the scope of devolution proposed by 2015 constitution is unparralled that clearly opens doors for shared vision and activities with our neighbors and other friendly countries. 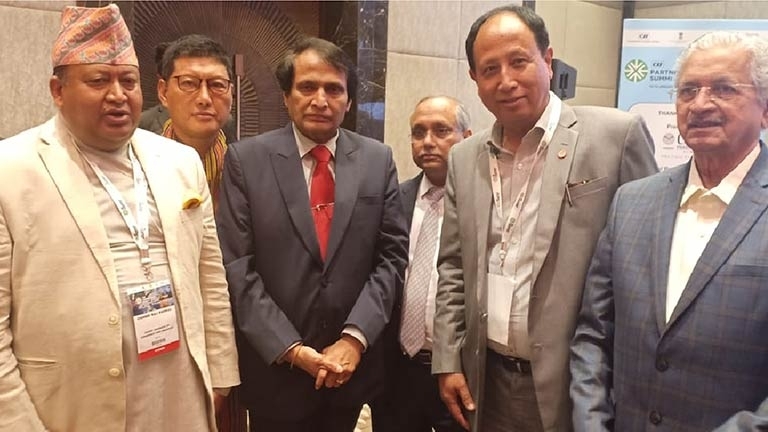 On the sidelines of the CII Partnership Summit, Mr Dhakal also met with Indian Commerce Minister Mr Suresh Prabhu and also discussed joint investments between the two countries. He also invited Mr Suresh Prabhu on behalf of FNCCI to Nepal to participate Industry and Commerce Day scheduled on April 11, 2019. Moreover he met with Chief Minister of Maharastra Mr Devendra Fadnavis and requested him to go jointly to promote tourism sector by increasing flights to Bombay to Kathmandu and also recalled about Nepal's religious places like Muktinath and visit of Prime Minister Narendra Modi earlier. He also had a meeting with Industry Minister and discussed on investment potentials. Nepalese Minister for Industry, commerce and Industry Mr Matrika Prasad Yadav also called for joint investments with Nepali investors and mentioned easing of doing provisions currently being enforced to attract foreign investment. At the same function, Vice President of FNCCI Mr Kishor Pradhan also informed to the foreign investors to start investments in Nepal for better returns as the majority government has already simplified investment approvals. Not only that, one stop service being developed by Nepal government will help to facilitate our investors coming from India and other parts of the world, said Pradhan. As South Asia, with its over 1.5 billion people, it is an emerging potential region in the world economy. 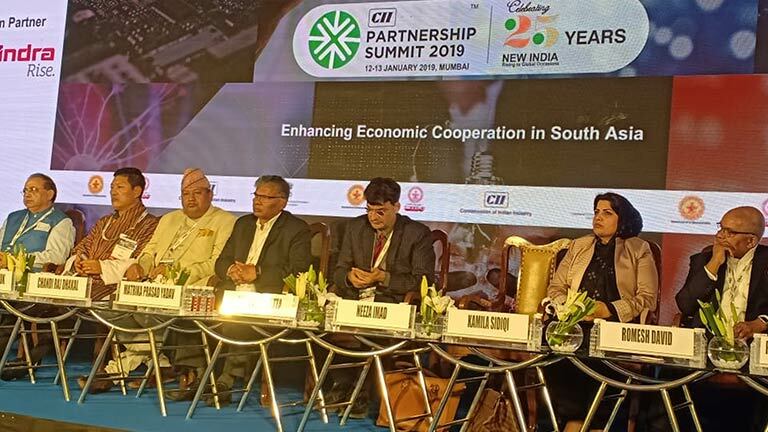 The trade and economic potentials exist in South Asia for which CII and FNCCI can join hands for increased investments at the regional level, said Indian and Nepali investors at the summit.